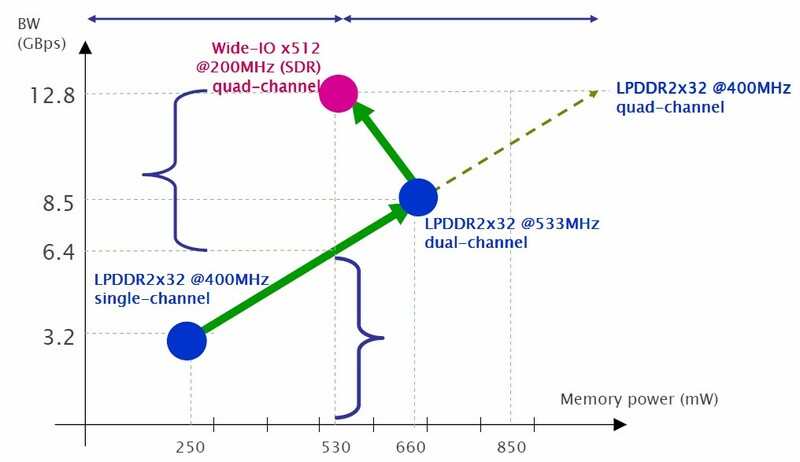 Wide I/O mobile DRAM using 3D stacking with TSV provides "double the bandwidth at the same power, or can cut power in half at the same bandwidth" compared to LPDDR2 and LPDDR3. It is reportedly "particularly suited for applications requiring increased memory bandwidth up to 17GB/second, such as 3D gaming, HD video and user multitasking." Wide I/O mobile DRAM enables 3D stacking with TSV interconnects and memory chips directly stacked upon a System on a Chip (SoC). The standard defines features, functionalities, AC and DC characteristics, and ball/signal assignments. The specification employs "LPDDR2-like" commands and timing parameters. The 512-bit memory interface has four independent 128 bits wide channels each operating at clock speeds to 266 MHz. resulting in a total bandwidth of 17 Gb/s for wide I/O SDRAMs (4.26 Gb/s/channel). The specification supports as many as four memory banks per channel, allowing die stacking of up to four wide I/O SDRAM die. The specification calls for 1.2V signal levels. - Mechanical layout of the chip-to-chip interface. - Memory thermal sensor locations for DRAM, to provide reliable operation given thermal gradients introduced by logic chips. JESD229 does not control the bonding configuration between the memory and logic chips – i.e. side-by-side with interposer, or stacked memory on top of logic. 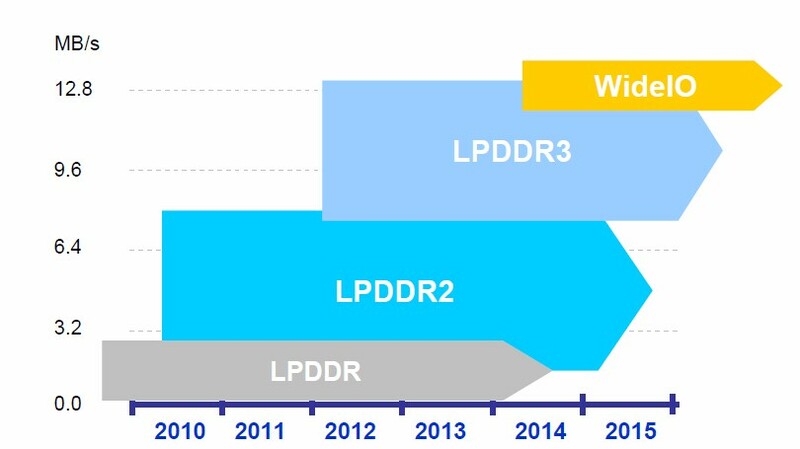 The next generation of this Wide I/O SDRAM specification, already underway, will reportedly deliver eight times the performance and support 2.5D assembly. The JEDEC committee expects wide IO memory to be in mass production by 2014. In late December Elpida announced that it has begun sample shipments of 4-gigabit Wide IO Mobile DRAM which will deliver increased performance and lower power consumption, aiming these products at the smartphone and tablet device markets. 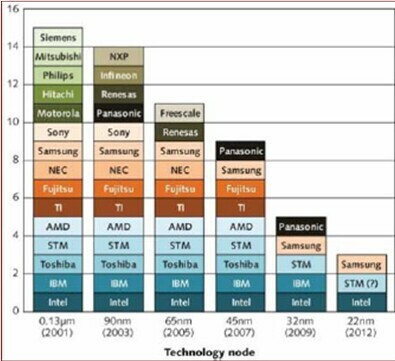 There are only 6 significant DRAM suppliers left in the world: Samsung, Hynix, Micron, Elpida, Nanya, and Powerchip. Elpida, born of the consolidation of the DRAM businesses of NEC, Mitsubishi, and Hitachi in 1999, is the last remaining Japanese DRAM manufacturer. "Elpida" is Greek for "hope" and like the Greek economy, Elpida, the Japanese memory company, appears to be out of hope and financially on its last leg. The major problem is that many of Elpida’s competitors have NAND to fall back on when the DRAM market is doing badly, but Elpida has only DRAM to keep itself alive. IFTLE views Elpida as one of the bright stars of 3DIC. Last fall IFTLE discussed the Business Week proposal that memory company consolidation was on the horizon [see IFTLE 69, "Cell Phones and Memory Consolidation"], how Elpida’s financial outlook was grim and how Toshiba was the likely merger candidate. Digitimes reports that Elpida and Toshiba are in talks to merge their business operations. The merger is being "pushed" by the Japanese government, which reportedly wants Japan to keep its DRAM technology ownership on shore. Micron has a 10-year agreement with Nanya (until 2018) to co-develop new DRAM chip technology. The two also run contract DRAM maker Inotera Memory via a joint venture. Nanya has posted losses for seven consecutive quarters but has been kept going by funds from its parent, the Formosa petrochemical group. Dr. Iyer informs IFTLE that IBM does not build a fab for every node except when there is a change in wafer size. "Our approach is to achieve a soft transition from one node to the other. As you may know we develop technology not just for IBM but also for Samsung, GF,ST and many others … so as these development programs are complete, the SOI technologies are manufactured at IBM and the bulk technologies are transferred to our partners. Our current fab has transitioned from 130 to 90 to 65 to 45 to 32 nm in the last 10 years or so … we expect this approach to continue. It is unlikely that we will outsource chips that we make for our mainframes, supercomputers etc. We only outsource OEM chips." IFTLE thanks Subu for that clarification.